One often hears the names Mohandas Gandhi and Martin Luther King, Jr. used during conversations about civil disobedience and freedom. It is also well known that King cited Gandhi as an inspiration for his own work during the Civil Rights Movement in the United States. But how exactly was King influenced by Gandhi? April 6 marks the anniversary of the end of the Salt March or Dandi March, a nonviolent civil disobedience in India led by Mohandas Gandhi challenging British authority by challenging restrictions on salt. Historically, local populations near the ocean had obtained salt from putting collecting pans in the saltwater and the marshes. However, beginning with the arrival of the British East Indies Company and continuing under the subsequent Raj, individual salt production was discouraged, taxed and eventually made formally illegal under the 1882 Salt Act, which gave the British a monopoly on the mineral. In late 1929, a few months prior to the March, the Indian National Congress, led by Gandhi and Jawaharlal Nehru, who would later become the first Prime Minister of India, publicly issued a declaration of self-rule, or Purna Swaraj. Following that, the Congress Working Committee, a subsection of the National Congress, appointed Gandhi to organize the first act of civil disobedience as follow up to the declaration. Gandhi’s suggestion of a protest against the salt tax was met with skepticism, as many believed it was not large enough in scale to make an impact. Nonetheless, Gandhi remained steadfast in his choice, arguing that salt was used by everybody in India, therefore it could cross societal and political boundaries and unify all Indians behind the cause. The Salt March lasted for 24 days, beginning on March 12, 1930 when Gandhi and 79 others, dressed in all white, left Sabarmati Ashram to walk through the Indian state of Gujurat to the coastal town of Dandi with the intention of producing salt. Along the route tens of thousands of people came to witness the march and others joined the protesters (members were expected to be highly disciplined and absolutely non-violent as some previous protests had erupted in acts of violence), eventually becoming a column stretching two miles long. Each night they stopped in a village, relying on locals to provide food and water and sleeping under the night sky. It ended on April 6th, having arrived in Dandi, when Gandhi picked up a fistful of salty mud stating, “With this, I am shaking the foundations of the British Empire.” He then processed the lump in seawater, producing salt. This act would serve as a driving force for the Indian Independence Movement and the civil disobedience movement nationwide. 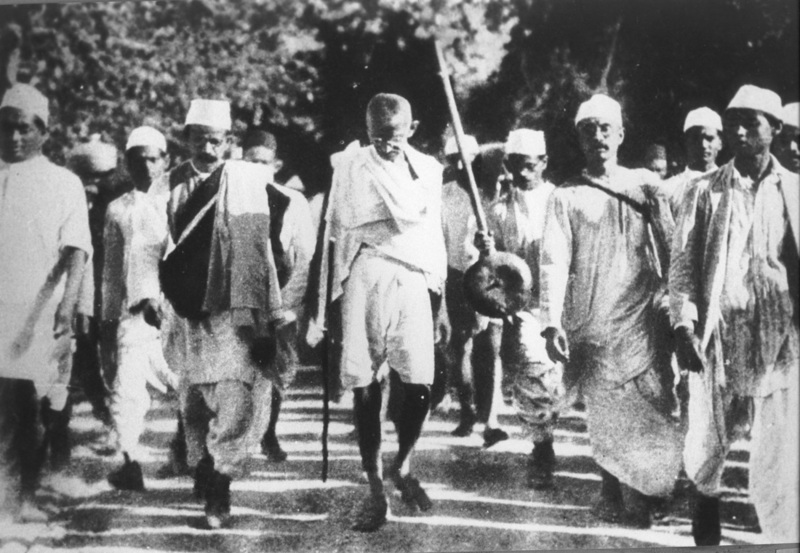 Gandhi continued pushing his cause following the end of the Salt March, which led to his arrest between May 4 and 5. These action sparked a tremendous response as across the country, millions began breaking the Salt Laws by producing or buying their own illegal salt. Gandhi and King each became figureheads for different movements in different nations—Gandhi demonstrated the strength of this defiant but disciplined approach in India and King adopted this ideology to the Civil Rights movement in the United States—but the underlying values of nonviolent civil disobedience and protest are the same. Since then, the concept of civil disobedience has been employed in nations around the world in order to protest government restraints placed upon the freedoms of individuals, as exemplified in the 2014 Umbrella Movement in Hong Kong and portions of the Arab Spring. The ideas of Gandhi and King have contributed to the development of modern societies globally in myriad ways, creating a standard where the moral authority resides in the protesters.